How To Make Money With TSU. Make Money With tsu social network will be a great experience online for all.Tsu is a great opportunity to make money from home, increase corporate revenues or raise money for a non-profit organization. Since Tsu.co itself does not invite anyone to the platform, it gives its users a short code to invite other members and distributes 90% of the revenue from its ads back to the users. This unique architecture creates an on-going revenue stream for its everyday users. This method will incentivize users to invite friends. The larger a user’s “network”, the more money they can make. As revenue grows in a user’s account, they will have an option of what to do with the funds. They can give credits or money to friends, tap into other apps that user credit products, and Tsu is supposedly going to have an online store where users can buy items directly from them. Lastly, if the user just wants the money, the user can fill out a W9 form and just have Tsu send them a check. This system is built for charities, musicians, athletes, writers, photographers, YouTubers, businesses or even just proud mom and dads to receive royalties for all of the content they publish. Tsu is a payment platform working in conjunction with a social-networking platform. Tsu find sponsors, partners and advertisers to advertise on its users pages and then passes 90% of that revenue back to the users. Just imagine if Lacoste paid you for wearing their shirt with the alligator and would pay you more if you went to a concert or mall where a LOT of people saw it! That’s bascially how Tsu works! Tsū is a free social networking platform where all of money made from the platform are distributed to the users of the platform in the form of royalties – after all, it is your content & your audience. Again, Tsu brings in money from 3rd parties, namely ads, sponsorships & partnerships. That money is then distributed to the users by giving 50% of any revenue created going directly to the content creator (this is similar to the YouTube© or SoundCloud© monetization models). The other 50% is distributed via an infinite series of 1/3’s up a family tree, which is created through a short code invitation. In the tree, 1/3 of any user’s generated economic goes to whoever invited them to the platform. Then 1/3 of 1/3 goes to whoever invited that user and 1/3 of 1/3 of 1/3 goes to whoever invited that user, etc. This network math propagates infinitely up the family tree, summing to 50%. So, in the end 50% goes to the content creator & 50% goes to the network who brought them to Tsū. For our efforts, we take a 10% fee once economics are created. User D invites Usher to join. Usher has 50M users following him and posts a unique picture of his new car and 10M users see this adding a bunch likes and comments. Advertisers have agreed to run ads where they would pay $1 for every 1000 people that see their ad (Called a CPM or Cost Per 1000 views). Tsu collects $10,000 from the advertisers and keeps 10% or $1,000 off the top. This trend continues until it is 100% of the revenue. I don’t know someone as big as Usher! How can I make money? If I already monetize my videos on YouTube©, can I also benefit from Tsū? as well. With Tsū, you get credit for just showing your audience the preview of your video. Have you considered joining Tsu yet? 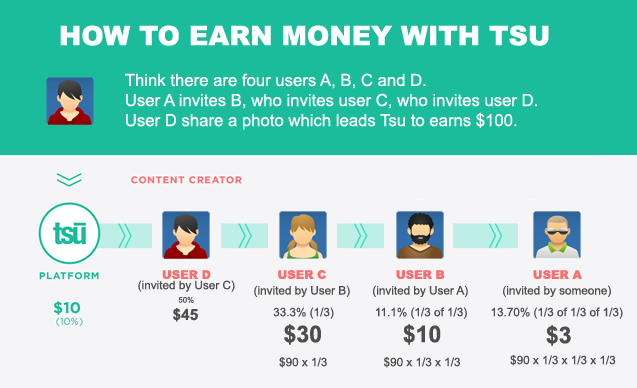 Tsu is a social media that pays you to post, comment, and like. Nicki Minaj and 50 Cent have already joined Tsu. You already do that anyway, so why not get paid for it? You can also make money from referrals, from your followers and followers' followers. So it's important to join before your current followers from other social media do. Thanks for sharing I'll join it now.